Retractable Awnings & Motorized Retractable Screens Schedule A Free, No-Obligation Estimate Today! Serving Sarasota, Manatee, Hillsborough And Pasco County. Duct Cleaning Restrictions apply. Call for details. Exp 5/15/19. Maintenance Package Call for details. Exp 5/15/19. Call for details. Exp 5/15/19. You Make The Call - We Handle It All! Create an outdoor escape that fits your lifestyle Schedule a free, no-obligation estimate today! 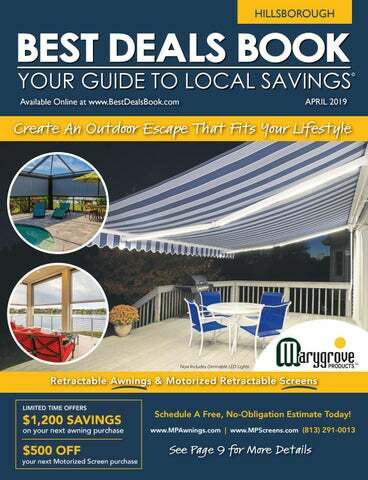 ON YOUR SCREEN PURCHASE Motorized retractable screens for: • Lanai • Balcony • Garage • Privacy • Window/Door • And more! We Cover You Like Family! WE MAKE YOUR HOME A SHOWPLACE! WE DO IT ALL! Our staff does it all! Nobody Does It Better... NOBODY! We Make Dreams A Reality! New Cabinetry or Refacing • Custom Countertops Bathroom Remodeling • Designer Closet Systems Complete Outdoor Kitchens • Plumbing Electrical • Flooring • Painting • Factory Direct Affordable Budget Plans • Complete Commercial Renovations 12 Mo. No Interest W.A.C.! • Buy American! • VA Approved! DESIGN CENTER HOURS: Mon - Fri 10am - 6pm • Sat 9am - 5pm • Sun by appt. NOBODY DOES IT BETTER: QUALITY, PRICE, SERVICE.....NOBODY! Ameritech Industries Makes Tile/Grout/Travertine & Marble Look Brand New Again! CALL TODAY! CALL TODAY FOR FREE IN-HOME ESTIMATE! plus FREE INSTALLATION! Schedule Your FREE Design Consultation Today! closet or garage of your dreams! 813.908.2777 *Call for details. Restricitions may apply. Expert Carpet, Tile & Grout Cleaning Call Today! Carpet Upholstery Tile & Grout Cleaning Now Serving Tampa Bay! Includes bathrooms & showers. Must present coupon. Expires 5/15/19. Must present coupon. Combination rooms are two rooms. Expires 5/15/19. Not valid with other offers. With this coupon. Offer expires 5/15/19. STORE UP TO 600 LBS PER RACK! HIGH QUALITY GARAGE FLOORING MOST DONE IN 1 DAY! DON’T BE CAUGHT IN THE DARK AGAIN! Lawn Analysis & Consultation Call for details. 15 Gallon Palm/Tree with any landscaping over $1,000 or more Call for details. Since 1999, over 66,000 satisﬁed homeowners and builders have chosen squeegee squad as their trusted neighborhood window cleaner. BE SAFE: We have liability insurance and workers compensation. FREE Design Consultation CALL US TODAY!! HOME More curb appeal. Less cash. Our concrete resurfacing and staining process makes it all possible. Only Concrete Craft offers the hi-tech expertise, custom quality, and backing of a trusted national home products corporation - and we prove it with some of the highest scores in customer satisfaction out there. Driveways, patios, ﬂoors and more - see for yourself. Call now! 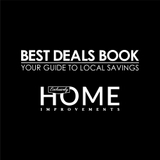 Call now for your free in-home consultation! Resurfacing · Staining Stamped Stone, Slate & Wood Finishes *At participating franchises only. Some restrictions may apply. Not valid with any other offer, discounts or coupons. Ask for details. ©2018 American Decorative Coatings, LLC. All rights reserved. Concrete Craft is a trademark of American Decorative Coatings, LLC and a Home Franchise Concepts brand. Each franchise is independently owned and operated. The CBD Industry’s Leader is Manufactured Right Here in the USA! We’re so confident you’ll like our products, we offer a money back guarantee within 30 days of purchase (with proof of purchase and the empty bottle). I was living with symptoms of PTSD - unable to sleep, night sweats, grinding my teeth, quick temper - until I found American Shaman. I appreciated that their products are non-GMO, non-pesticide and made in the USA, so I gave it a try. I was falling asleep as soon as my head hit the pillow, and sleeping through the night. That was six months ago, and it’s still working for me. I wake up rested and feel better throughout the day. Buy 2 Cloud/Water We offer a wide variety of hemp health & beauty products! These statements have not been evaluated by the FDA. This product is not intended to diagnose, treat, cure, or prevent any disease. For use by adults 18+.— Keep out of reach of children. Should not be used by pregnant or breast feeding women. * Our Hemp Oil products contain high amounts of Cannabidiol (CBD), are all-natural and extracted organically with CO2, Gluten free, organic, non GMO Hemp, and have no heavy metals or insecticides. They’re Terpene rich, and batch tested.